From the makers of the original Borner V-Slicer, this Swissmar branded version offers the same performance in a slightly different package. 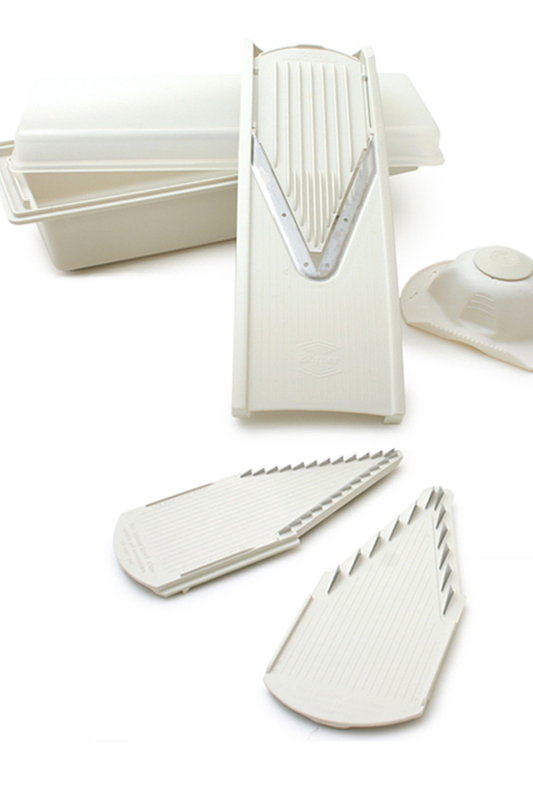 This high quality mandoline will be identical to the V-1001 that comes in the V-Slicer Plus set, but instead of the storage box, it comes with a multi-function bowl that some people may prefer. With the included lid, you can use this bowl to collect what you cut, save some for later, or contain the whole set for storage when not in use. The 7 piece package also includes a safety food holder to protect your fingers, a thickness insert to allow for fat or thin slicing, and two julienne inserts with different thicknesses that will allow you to chop veggies into cubes, or make longer sticks. With this powerful set on hand, you'll be able to prep like a pro as you slice, dice, chop, shred and julienne faster than ever, and thanks to the advanced design, you will get perfect looking, uniform results each time you use it. Cut oranges for a snack. Slice onions and tomatoes for burgers and sandwiches. Prepare apple slices when baking. Shed potatoes for hash browns, or cube them for home fries. Thinly slice potatoes for making homemade chips. Shred cabbage or lettuce for coleslaw and salads. Create long strips from veggies for pasta, stir fry or salads. Make celery sticks for a dip tray. Portion veggies prior to canning. Dimensions 15" x 5.5" x 1.5"
Adjustable Yes. 2 different thickness settings. Perfect, professional results every time. For quick and easy cutting of any fruit or vegetable, this slicer is tough to beat. German engineered precision, and high quality blades make cutting any food effortless. Order Yours Today! Wish I'd found this slicer decades ago! I'm not the hottest chef in the kitchen by any stretch of the imagination. Have basic cooking skills, thanks to Mom, but often don't know the right tool for a given job. Wish I'd know about this slicer many, many years ago. Slices quickly, evenly, and ... importantly ... safely! What a great tool for a guy who doesn't want cabinets stuffed with "why did I ever buy this" items. The 7 piece set just arrived today and I've already used it to make a sliced cucumber salad. I love the box & lid it comes with - very compact and safe storage. It has a lot of great pieces but, for a more complete set, I added the 10mm insert (KI1001EB2 V-Slicer Blade Inserts) and waffle slicer (KI5631 Borner Adjustable Wave Waffle Slicer). Can I order only one? A Curly Design Shredder for Fruits, Veggies & Cheeses.